The most popular beverages in human history have always been alcoholic beverages, so it should come as no surprise that drinking games are among the most popular games. We don't have any at Snakes and Lattes of course, for perfectly logical reasons. But this week on the SnakesCast, we're going to talk about drinking games, and (beyond the obvious) the reasons they're appealing. Games mentioned: Beer Pong, Flip Cup, Bounce Off, Thumb Master, Ring of Fire, Kings, Gotcha! How much fun is a game? It's totally subjective, and so are a lot of questions about games. But some questions should be able to produce a reliable, objective answer. Like, how big is the box? How many cards in the deck? How many people can play? That last question should be just as straightforward as the other two, but when you take into account people's preconceived ideas about how a game should work, and the amount of pressure on marketers to sell as much as they can... well, how can you tell when it's true? The idea of playing a co-operative board game, where all the players work together to defeat the game itself, might have seemed strange ten years ago. Today, it seems strange that people might ever have thought it seemed strange. And that is largely because of a little game called Pandemic, which goes under the game spotlight this week. We'll also be talking about Pandemic Legacy, which a lot of people are calling game of the year for 2015. Certain things make a game really well-suited to recommending at a board game café. Cute artwork, being awful to the other players, and amusing failures, for example. But other things can make a game a pretty hard sell in that environment. Things like card counting, fantasy themes, and game mechanics that aren't easy to compare to anything well-known. This week's game spotlight shines on a title with all of the above. Let's see how it does. You can learn a lot about someone by playing with them. When you watch how people make choices, how they react to adversity, how they manage their resources, negotiate, plan, lie, tell the truth, win, and lose, you see a great deal of who they really are as people. But most of the time when people ask for a "get-to-know-you" game, that's not what they have in mind. 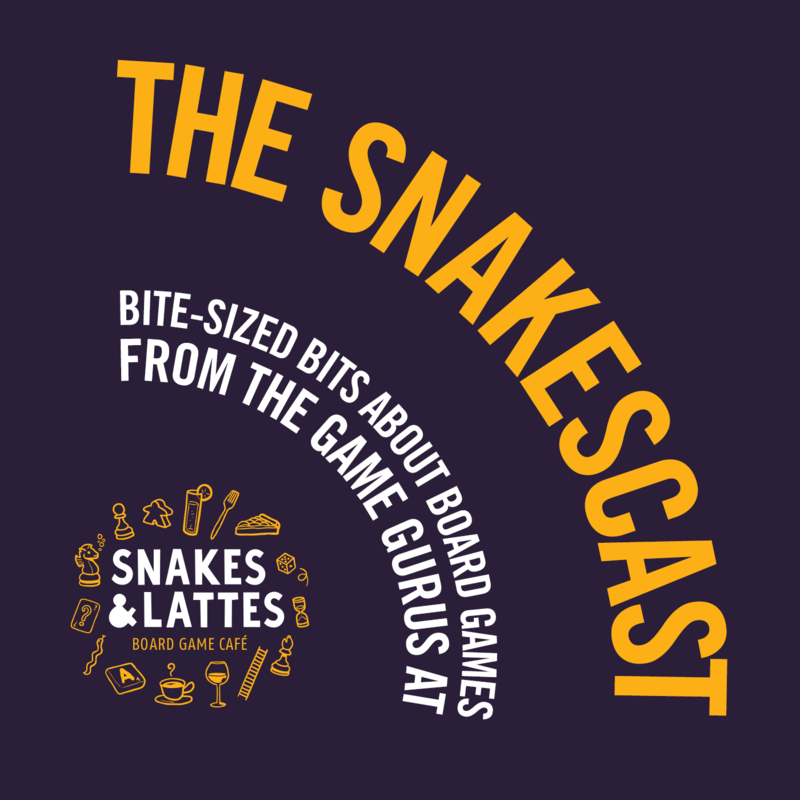 This week on the SnakesCast, we talk about the disconnect between play and conversation, and which one is truly more revealing. We've talked before on the SnakesCast about how to teach games, but we've never talked about how to learn them, especially when you don't know anybody who's played before. Everyone's process is different, and this week we're going to hear about some very different ideas about how to learn a game well enough to be able to teach it to your friends. Acclaimed French board game designer Antoine Bauza has taken us on many trips to Japan through his games, including Tokaido, Hanabi, Takenoko, and now Samurai Spirit. It's a co-operative game based on legendary film maker Akira Kurosawa's classic "Seven Samurai". And it's just as hard to beat as Bauza's other famously punishing co-op game, Ghost Stories. What gives Samurai Spirit its strength, and what are its weaknesses? "Hide and Seek" is one of the most popular and enduring games in all of human history, and with good reason. But modern life can present some practical barriers to that game, and so this week in the Game Spotlight we present the latest entry in the world of board games that takes on this venerable and tense dynamic of hunters and hunted. It's called Specter Ops. "Simple games are short, complicated games are long." For people into this hobby, that tends to be the rule. But every rule has exceptions, and this one has a lot of them. So if you're trying to stump the gurus, asking for a long game that's simple to learn might be a good way to do it. In this week's Guru Voodoo episode, that's the challenge we're up against. Anyone who loves starting with something small and growing it into something massive and awesome can enjoy the basic engagement of a deckbuilding game. And although other games as early as 1993 featured building a deck of cards from a collection, it wasn't until 2008's Dominion that players would get to build their deck as part of the game itself. In this week's SnakesCast, we take a look at this popular genre and what makes it so widely beloved. You can also download last season's episode about collectible games, like Magic: The Gathering. They feature a very different kind of deckbuilding, and were an important inspiration for the kind of modern deckbuilding games we discuss in this week's episode. A new gateway game is born? Certain games form part of a kind of ludological canon. Catan, Ticket to Ride, Carcassonne... these are games whose name alone keeps them selling well. It's hard for a new game to join that hallowed group. But this week in the game spotlight, we take a close look at a game that seems to have been designed with the express purpose of taking Carcassonne's place in the canon. It's a little game called Cacao. The year was 2000. The Settlers of Catan had only recently been translated into English, and a small but dedicated groundswell of players was coming to discover an amazing new world of games. Into that world sprang a game called Carcassonne. Small, inexpensive, quick and easy to play, it was THE game to introduce to people who weren't so sure about straying from Monopoly and Uno. But that was fifteen years ago, and games have come a long way since then. How well does the original "gateway game" hold up today? Jonathan finishes out his tips on teaching games this week, going into questions of what to explain, what order to explain it in, what to emphasize, and what to leave out entirely. Spoiler: it depends on a lot of things. Most people don't need to be told how difficult it can be to teach people how to play a board game. There's so much to cover, and if you go about it the wrong way, even the most well-designed, most "fun" game can become a deeply unpleasant experience. This week Jonathan's on his own, sharing tips on how to teach. For much of recorded history, the idea of going to sea was like the ultimate adventure for many. Traveling to distant lands across the vast and unknowable depths, and returning to tell the tale... the sea has provided grist for many of our most beloved stories. But today, nautical adventures are a relic of an earlier age, and the closest many of us will ever get to experiencing it will be at the tabletop. Are there any games that convey the feeling of these bygone adventures? You've heard us mention it before, and now it's going into the game spotlight. It's the game that we played more than any other at this year's GenCon. It's a high concept with a simple but effective design to back it up. It's a crossover game that'll get reality TV fans to play a game that involves magic bows and arrows. It's Vault Wars. Social deduction games like Mafia, Werewolf, and The Resistance have been popular at Snakes & Lattes for years. They're short and simple when it comes to rules, but they're stressful and memorable just the same, because you can never be sure who's on your side. This week the Game Spotlight shines on Good Cop Bad Cop, the latest specimen of this genre to hit our tables. And it may just be the genre's biggest hit so far. What kind of games would you bring to a party for a friend who's getting married? And if all the attendees were women, how would that affect your choices? This week's Guru Voodoo is all about bachelorette parties, and how to make games an enjoyable part of the experience. Space isn't as big a deal as it used to be in popular culture, but it's still pretty huge in board games. It's an incredibly rich and exciting theme, because of just how much possibility it contains. But tabletop games, by their very nature, are contained, bounded experiences. How can you convey the experience and the feel of a space story in a board game? Just a scant two weeks ago, the Snakes & Lattes Away Team road tripped down to North America's largest celebration of everything awesome on the tabletop. Along with sixty one thousand other people who love games, we played, we feasted, we socialized, and got very, very tired. This week on the SnakesCast you'll hear from us on the road before day one, at the start of day three, and on our long road trip back home. Apologies for the ambient road noise and exhaustion.